Choose stylish and durable ceramic tile from our expansive collections. It adds a distinct look to any room or area of a home or business. Shop our extensive showroom to find the perfect flooring for your needs today. Upgrading flooring is an affordable and efficient way to quickly transform the interior of any property. A smart choice for high-traffic areas, ceramic floor tile is a smart option when you need flooring that will hold up over time. This flooring works perfectly in multiple rooms throughout the home, including living rooms, dining rooms, kitchens, bathrooms and more. It is resistant to water and stains, and is very easy to clean. If you love the elegant appearance of hardwood, a new ceramic woodgrain tile floor offers you that high-end look for less. Offering the beauty and classic looks of wood with the durability and moisture-resistant nature of tile, these floors are a stunning choice for any area in your home. We have a wide range of colors, textures, and styles available for you to choose from at our showroom, so stop by and view our selection today. Ceramic bathroom tile is always an excellent choice. Bathrooms are exposed to moisture on a regular basis, more than any other room in your home. The durable, water-resistant nature of tile makes it the perfect choice for your home’s bathroom. Imagine stepping out of your shower onto a cool, smoothly textured tile floor, without having to worry about potential water damage. A new tile bathroom floor offers that pleasurable experience. In addition, these floors add value and appeal to your home, and are capable of lasting for many years to come. If you’re interested in adding beauty and aesthetic value to any space in your home, mosaic tiling is the perfect choice. Add them to your bathroom, your kitchen, or your entryway for a stunning and unique stylistic touch. The range of looks you can achieve with these tiles is practically limitless. Our designers will find the perfect mosaics to match your tile design vision. Enjoy the creativity of our mosaic collections to enhance your home’s appearance beautifully and affordably. Now is the perfect time to add ceramic tile to your home. Get in touch with us today for more information. We look forward to helping you select a flooring option you'll love. There are many benefits that come along with a new ceramic tile installation. Ceramic flooring is very easy to maintain, so you won’t have to worry about constantly cleaning it. With grout, tile is almost entirely resistant to water damage. Combined with the proper use of sealant and cleaning products, your new tile floors will last you for years to come. In addition to being durable, tile is also highly adaptable. Whether you’re tiling your kitchen or creating a portico for your dining room, the possibilities for your tile floor are practically endless. Ensure the longevity of your new floors with a professional install by our crew. The quality of your installation is as important as the quality of the product you purchase. Protect your investment with installation from our team. And, take advantage of our guarantee to fix any installation-related issue for the duration of your floors. 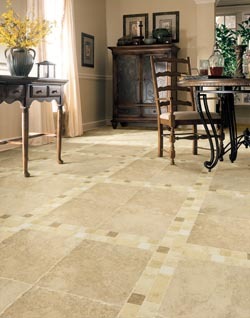 Contact us when you need ceramic tile. We are proud to serve our customers in Vernon, South Windsor, Ellington, Tolland, and Manchester, Connecticut.